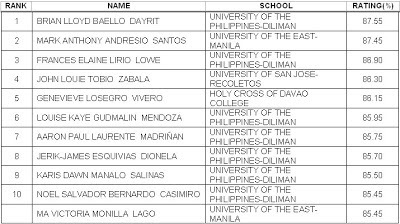 The Professional Regulations Commission thru www.gov.ph announces the results of November 2012 Librarian Board Exam. A total of 379 out of 812 or 46. 67 percent of examinees passed, PRC said. Registration for the issuance of Professional Identification Card (ID) and Certificate of Registration will start on November 15, 2012 but not later than November 16, 2012. The results is released 2 days after the examination. Official results is not yet posted in the PRC website as of this posting but informed thru Official Gazette (www.gov.ph). This is due to encountered technical problem or downtime for PRC web. 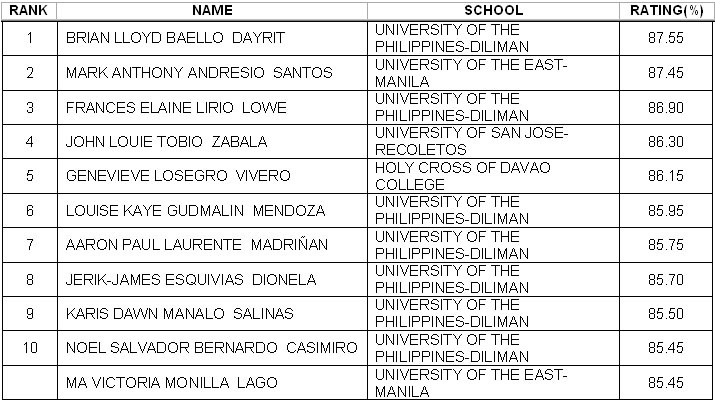 Brian Lloyd Baello Dayrit from University of the Philippines - Diliman leads 379 passers with 87.55% rating.